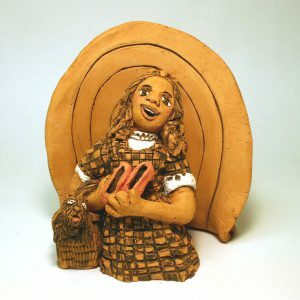 My series of "Stars in the Heavens": Judy Garland as Dorothy singing "Somewhere over the Rainbow" in "The Wizard of Oz". 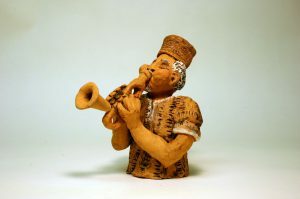 This series of figures portrays widely recognized famous personalities with connections to music. 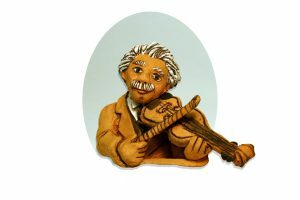 My series of "Stars in the Heavens": Albert Einstein, who also played the violin for fun like my Dad, after work. This series of figures portrays widely recognized famous personalities with connections to music. I had a chance to sing with Rudy after ceramic classes in grad school at the U. of Montana. This series of figures portrays widely recognized famous personalities with connections to music. My series of "Stars in the Heavens": Dizzy Gillespie the great trumpet player. See his unique instrument. 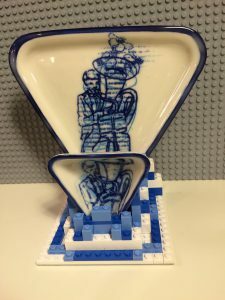 This series of figures portrays widely recognized famous personalities with connections to music. 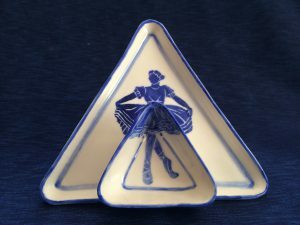 Porcelain Dinnerware celebrating the performing arts, based on a triangle. Nesting pitchers, bowls, cups and plates are available. Slip cast original shapes designed by me with my illustrations. Nesting pitchers, bowls, cups and plates are available. Slip cast original shapes designed by me with my illustrations. LEGO bricks used for support. 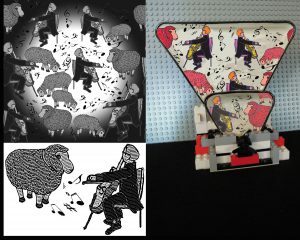 I've discovered that my sheep and animal imagery is most popular with the general public, and I sell more dinnerware with animals. But here I'm experimenting with adding music to my images and playing with colored decals. With Andromeda software I can created halftones for my illustrations when making silkscreens. 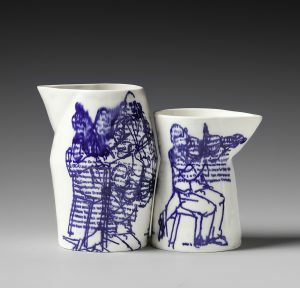 Nesting pitchers originally created at a residency called Guldagergaard, the Ceramic Research Center in Denmark. I was there in 2012 as a resident artist. I applied printed decals on top of the glaze and refired the pitchers. The musicians are from a classical concert sketched in one of my program guides. 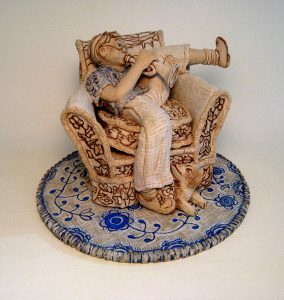 Stoneware Sculpture inspired by Norman Rockwell's famous painting of a red headed young boy practicing the trumpet. In my version the boy is a teenager, with scenes of Denmark on the armchair. 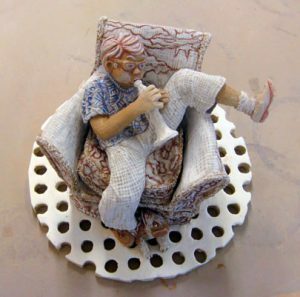 I made it at Guldagergaard, the Ceramic Research Center, Denmark, during my 2011 residency there. Unfortunately, it was lost in the mail when shipped home.